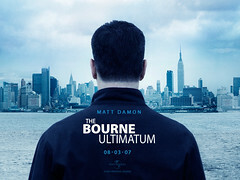 After the considerable success of The Bourne Identity and The Bourne Supremacy, it’s time for the third film in the series - The Bourne Ultimatum. Thankfully, it’s arguably the best so far. Where Ultimatum really comes into its own is the sheer pace at which the story unfolds. Director Paul Greengrass maintains an extremely high tempo throughout the movie. As Bourne attempts to keep one step ahead of his pursuers, Greengrass employs generous helpings of handheld camera shots and ultra-quick cuts to keep up the breathless ride. Every now and again, he’ll give the audience a few minutes’ respite, before revving up again. And Bourne certainly gets around. Even as the plot races through Moscow, Paris, London, Madrid, Tangiers and New York, each city is given room to shine. The Waterloo Station and Tangiers scenes are particularly memorable. Damon plays it straight down the middle. There are no cheesy one-liners here. There’s a strong supporting cast, with solid turns from David Strathairn as his CIA nemesis Noah Vosen, Joan Allen as a more sympathetic CIA director, Paddy Constantine as a British journalist and Albert Finney as the scientist mastermind behind the Treadstone programme. Of course, comparisons with the James Bond series are inevitable. In fact, the Bourne and Bond franchises have more differences than similarities, although it’s interesting to see how the latest Bond film – Casino Royale – cuts back on the gadgets ‘n’ girls formula and has a more Bourne-like, gritty feel. Perhaps they’re inspiring each other – certainly a couple of scenes (a rooftop chase and bathroom hand-to-hand scrap) crop up in both Casino Royale and Ultimatum. Greengrass keeps the violence focussed. This is no gore-fest. The bodycount is surprisingly low for a movie of this type and there’s little blood to be seen. Which is not to say the fights aren’t brutal: Bourne often gets stuck in and works hand-to-hand, with the camera so close it’s often difficult to see what’s going on. The quick cuts are deliberately disorientating – but not annoyingly so. The film serves up some interesting issues. Who is the real enemy? Where are the safeguards against an unaccountable government? In a ‘war against terror’, do the ends justify the means? Other movies have touched on similar themes. But what seemed fantastical in 1998’s Enemy of the State now seems worryingly more plausible in the post 9/11 era. Particularly, one scene in Ultimatum has eerie parallels with the July 2005 police shooting of a Brazilian electrician at a London underground station, in what turned out to be a calamitous case of mistaken identity. Of course, with any action thriller you have to suspend your disbelief. Fortunately for the screenwriters – and the audience – the frenetic direction doesn’t leave much time to pick holes in the plot, although one does wonder at Bourne’s miraculous ability to find unbarred windows to leap through in even the most maximum-security installations. Clearly, neither Bourne nor his CIA pursuers seem to believe in the adage ‘look before you leap’. And despite producing dispassionate and unemotional operatives via the Treadstone project, the CIA clearly hasn’t kept that philosophy for senior management. Straitham’s Vosen, in particular, takes every opportunity to make snap decisions in times of crisis rather than first considering his options. Sin in haste, repent at leisure. He doesn’t learn. By his nature, Bourne is a loner. There’s no romance in the movie, though fellow CIA employee Nicky Parsons (played by Julia Stiles) pops up to give Bourne someone else to look after. Refreshingly, the character of Pamela Landy (played by Joan Allen) gives one female a strong role at least. The soundtrack is functional and unobtrusive, helping pitch the mood without being overly noticeable. And that’s the way it should be – there’s enough going on already without additional distractions. For a Hollywood blockbuster, Ultimatum is sharp, fast-paced and tight. If you do go and see it, pay attention and enjoy the ride. This article is by guest author Paul H. Paul is an international man of mystery, he comes from the UK and lives in Pune. Paul H also blogs at http://worldofpablo.com. Bearing no relation to Robert Ludlum's original novel - picks up where Supremacy left off. Amnesiac ex-CIA hitman Jason Bourne (Matt Damon) remains on his quest to rediscover his real identity. So far, the trail has led him to discover his involvement in the clandestine 'Treadstone’ project. The top brass at the CIA still consider him a serious threat (despite his best efforts to convince them otherwise), and new Deputy Director Noah Vosen (David Strathairn) wants him located and terminated.